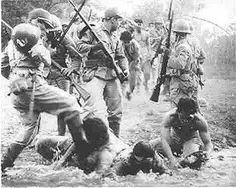 The Pantingan River Massacre happened during the Bataan Death March. 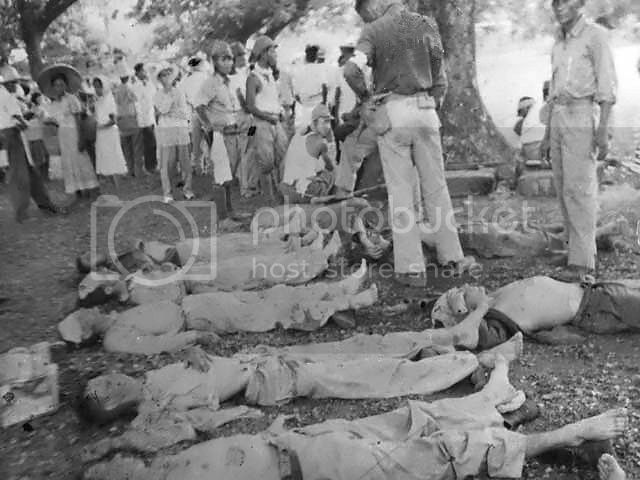 Hundreds of Filipino soldiers who surrendered to the Imperial Japanese Army, most of whom belonged to the Philippine Commonwealth Army’s 1st, 11th, 71st, and 91st Divisions of the USAFFE were taken to the riverside by the Japanese soldiers were shot, bayoneted or beheaded. On April 11, 1942, Filipino troops of the 91st Philippine Army Division under Brigadier General Luther Stevens, were separated from their American officers and moved to the Pantingan River near Mariveles. “At about noon, a Japanese officer identified as Lt. General Akira Nara, 65th Brigade Commander, arrived by automobile … There is no record of what Nara said during a quick conference with his officers but no sooner had he left, when all Filipino officers and non-commissioned officers in the group, about 350 to 400 men, were lined up along the trail. The Filipino privates were ordered to move on but the rest of the captives were formed into three groups and their wrists tied securely with double-strand telephone wire. They did not make it. Dead soldiers in Bataan. “The massacre of the Filipino officers and non-coms of the 91st Division was apparently the only mass execution to take place on Bataan.” Whoever was responsible for the slaughter, it was without doubt the worst single atrocity of the war. Other survivors of the massacre include Lt. Manuel Yan who later became head of the Philippine Army and ambassador to Thailand. Another survivor, Capt. Ricardo Papa, a G-3 Officer of the 91st Division later became a Chief of Police in Manila. After the War, General Tomoyuki Yamashita, commander of all Japanese forces in the Philippines, General Masaharu Homma, whose troops were responsible for the Death March and General Kou Shiyoku, commandant of the POW camps in the Philippines, were tried by a US Military Commission in Manila, and executed. Lieutenant General Akira Nara, 65th Brigade commander, was never charged.